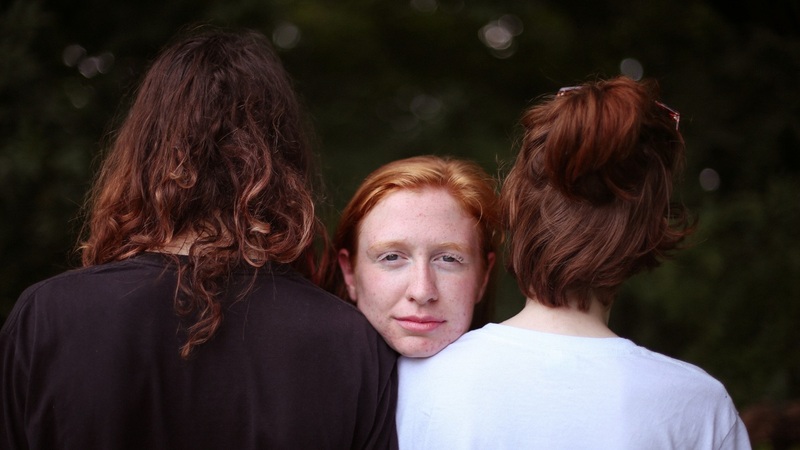 Songs We Love: gobbinjr, 'manatee' An earnest, twee melody evokes, in the words of songwriter and producer Emma Witmer, a "mid-conversation daydream." gobbinjr's new album vom night, a split with illustrator Sophia Foster-Dimino, comes out Nov. 4.
gobbinjr's music is permeated by a sense of intimacy. Its debut album, manalang, found Emma Witmer — the project's sole writer and producer — singing with bruising honesty about unrequited love and self-loathing through precise moments: dreaming your crush's girlfriend died, wondering if you forgot to take your medicine, planning your own funeral. On gobbinjr's upcoming EP, vom night, Witmer's trademark vulnerability is in full force. Over layers of synthesizers and drum machines and through bedroom-pop melodies, she tells of feeling needy or shy, wanting to be wanted and hoping for better things for her friends. On vom night, the songs don't stand alone; the EP is actually a collaboration with illustrator Sophia Foster-Dimino, who created a mini-comic that provides a visual counterpart to vom night's six songs. The comic touches on many of the same themes as Witmer's lyrics: the ways we can get trapped in our own heads, how difficult it can be to connect with each other, how rewarding it can be when we do. Like the narrator of Witmer's songs, the protagonist of Foster-Dimino's comic is deeply introspective, slightly sad and struggling with the weight of loved ones' concerns. This sense of being caught between personal connection and emotional isolation is threaded through vom night's opening track, "manatee." In an email to NPR Music, Witmer explains that the song is meant to evoke "a mid-conversation daydream in real time" — Witmer-as-narrator zones in and out while staring into someone's eyes. "manatee" feels earnest and twee, with Witmer's voice floating over punchy percussion and sunny guitars as her attention drifts off and then back. "I tried to paint a picture of myself tuning back in, being flustered by my own inattention and lamenting in the real, non-fantastical world," Witmer says. As a result, the song leaves you feeling transported, even if it eventually returns you to the mundane. vom night, a split between gobbinjr and Sophia Foster-Dimino, is due out Nov. 4 via JMC Aggregate.